At three months, a pit bull is still a puppy, which means it has a lot of energy and a lot of potential. 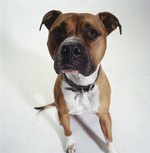 Because pit bulls are known for their intelligence, and dogs are not prone to messing their living spaces, convincing them to follow a set of potty training rules should not be daunting. The Humane Society asks new pet owners to remember that a puppy can control his bladder one hour for every month of age; therefore, a 3-month-old pit bull should be taken for a walk every three hours. Establish a feeding schedule. Be sure to take your dog out 10-15 minutes after giving him a meal or water. Do not leave a puppy's food or water bowl out for long periods of time. It is important to monitor your puppy's eating and drinking habits so that you know when to take him out, thus creating a pattern of reliable and successful behavior. Crate train your puppy. By crate training your puppy, you will provide him with a safe and comfortable environment in which to spend time while you are not watching him. If your puppy is crate training, he will be less likely to have an accident in the house, and in turn you will not have to reprimand him. It is important to remember that a 3-month-old pit bull should not be crated for more than three to four hours at a time. Because a young pit bull is small, he has limited bladder control. Establish a walking schedule and use positive reinforcement. Take your 3-month-old pit bull out regularly, preferably every three hours. When he goes to the bathroom outside, praise him elaborately and give him a treat. A puppy will want to continue behavior that pleases you. Be sure to include play time with potty time. Plenty of exercise will cause your puppy to respect, and therefore listen to you more.